The image taken by the MESSENGER spacecraft on Sept. 27, 2009. shows the planet Mercury as it appeared to the probe 55 hours prior to the closest approach of its third flyby, which was set for Sept. 29 2009 at 5:55 pm EDT. Thisstory was updated Sept. 29 at 7:20 p.m. EDT. 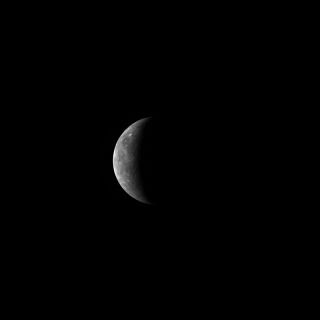 A NASAspacecraft zoomed by Mercury Tuesday to snap pictures of the planet?s unchartedregions and fine-tune its path through the solar system, one that willultimately place the probe in orbit around the small, rocky world. TheMESSENGER probe skimmed just 142 miles (228 km) above Mercury at its closestapproach as it whipped around the planet during the flyby, the last of threedesigned to guide the spacecraft into orbit around the planet in 2011. The spacecraftwas expected to snap about 1,559 newphotographs of Mercury, some of regions never before observed up close. ?Radio signals received after the spacecraftemerged from behind the planet indicate that the spacecraft is operatingnominally,? said flight controllers at MESSENGER?smission operations center at the Johns Hopkins Applied Physics Laboratory(JHUAPL) in Laurel, Md., in a statement. ?Its instruments are now collectingimages and other scientific measurements from the planet as it departsMercury.? The firstnew images from the flyby are expected to be released on Wednesday. MESSENGERmade its closest approach to Mercury at about 5:55 p.m. EDT (2155 GMT) when itsped by at about 12,000 mph (19,312 kph). The probethen flew behind Mercury, passing out of communications with Earth for about anhour before restoring contact. Mercury?sgravity was expected to slow MESSENGER by about 6,000 mph (9,656 kph) during the flyby and place it on track to enter orbitin March 2011. MESSENGER snapped a photoof the planet Sunday that revealed it as a half-lit, desolate-looking worldas seen from a distance of about 418,000 miles (672,000 km) away. The $446million spacecraft flew by Mercury twice in 2008 to map the planet inunprecedented detail while using the rocky world?s gravitational pull to refineits flight path through space. ?Aplanetary flyby is really like Christmas morning for scientists,? saidMESSENGER principal investigator Sean Solomon of the Carnegie Institution ofWashington before the rendezvous. ?We expect to be surprised and we expect to be delighted.? In all,MESSENGER has photographed about 90 percent of Mercury?ssurface and was expected to cover another 5 percent of unmapped terrain when it flewby today. The spacecraft is the first probe to visit Mercury since NASA?sMariner 10 mission in the mid-1970s. Unlike MESSENGER?s first two flybys - which revealed the firstclose-up views of Mercury in decades - Tuesday?s rendezvous was aimed atobserving specific points onthe planet?s surface. The probe was commanded to target its camera eyes at interestingcraters, measure Mercury?s magnetosphere and tenuous atmosphere, as well asstudy the planet?s odd, comet-like tail of trace gases. ?This isthe last look at Mercury?s equatorial region, and it?s the last time we flythrough the tail,? Solomon said. WhenMESSENGER arrives in its final orbit around Mercury, it will begin along-awaited observation phase that will complete its new maps of the planet.NASA launched MESSENGER - short for MErcury Surface,Space ENvironment, GEochemistry,and Ranging - in 2004. The probe swungpast Earth once and Venus twice before beginning its three Mercury flybys.